And now, it’s time to talk JetBlue. When I read a recent article where David Neeleman talked about JetBlue, I thought he sounded bitter, so I had to ask. It’s clear that he’s still bugged by what happened at JetBlue, and as a shareholder, he wants to see things change. You can catch up with part one and part two, if you missed them. Cranky: Some would say that the rapid growth of JetBlue is what caused you problems there. Is that an issue here? Or do you not think that was issue there? built for lower fuel costs than what we had. So it took an adjustment period. That was part of it, certainly infrastructure. I was more focused with growing the business from a marketing perspective and I think our operation didn’t keep up maybe as well as it should have. I had a COO [current President and CEO Dave Barger] that was in charge of that. I think the Valentine’s Day storm showed a weakness in operational recovery areas so that’s an issue. I looked at that experience in Brazil and we have a great team of people down there. We built all of our systems in the beginning, where JetBlue should have been. There was some people who were supposed to be focusing on that, obviously they weren’t. So I’m not leaving anything to chance. Cranky: It seems, the article I was reading, it seems that there’s still sort of an almost bitterness about what happened there. Maybe it’s just a dissatisfaction. Does it still bother you? Obviously, Azul means blue. Is this still something that bugs you? David: Yeah, it bugs me. You had a board that was rash and hasty and made a decision that didn’t need to be made at the time. The crewmembers didn’t really deserve that kind of treatment either. They had a certain vision for the company, an expectation. All of a sudden overnight that was changed. Things are different at JetBlue today. They’re not the same as they were. Maybe some areas they needed a change, but you know, the camaraderie we had, a lot of things we did in the customer service area, I just don’t think it’s the same company and there are a lot of people lamenting that. Every time I fly, people say such things. “Wish you were back.” I wish they would say, “We’re doing great, it’s awesome. Thanks for starting it.” I would much rather have that. I built JetBlue for one reason. I didn’t need the money. I wanted it to be a great place to work, a great place for people to fly differently than the other guys. Same thing at Azul. It’s your legacy, you know. And you want to make sure. I still think JetBlue is better than anyone else but it’s not the same. When you get bigger, it’s hard to keep it the same. But Southwest Airlines has been around for 40 years and they’ve been able to maintain a lot of happy people working there. Cranky: You’re still a fairly large shareholder. As a shareholder, what would you want to see JetBlue do differently? David: I would like to see it focus on customer service. I tell people that at Azul. I only have two goals for the company. I want this to be the best place you ever worked and I want every customer to say, “wow, that was a great flight.” If you can do those two things, you’re gonna grow and be successful. That’s really it. It’s just a focus. I’ve been on some delayed flights on JetBlue lately and didn’t hear anything about the customer bill of rights. In those days, we did things that were special. JetBlue still wins the JD Power award every year but if you look at the scores, it’s all the TVs and more legroom. If you look at the customer contact scores, Southwest wins all those awards, those categories. And they never did. I think you can make a difference in a commodity business. Cranky: Back to Azul for a second then I’ll let you go. Can we expect to see Azul outside the Brazilian borders? David: The market size just isn’t that big. Don’t know if you saw the news on TAM and LAN, still trying to figure out what the heck that is, but the cross border stuff in South American countries is just a tiny fraction. Maybe it’s just a play for TAM to get some management over there, but the market’s just not that big and the market in Brazil is huge. So we’re going to focus on Brazil. Never say never, but we’ve got plenty to do. 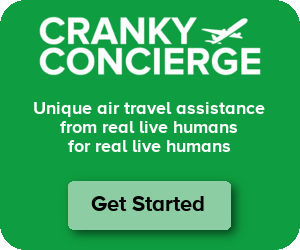 Cranky: Not likely to see any widebodies coming in, right? David: No, not now. We’re small guys now. We like smaller – much bigger opportunity there. Cranky: I appreciate it. Good luck continuing to grow Azul. Maybe one of these days I’ll be down there and take it for a ride. David: That’d be great, we’d love to have you. Great article! However, I have no clue what the relationship with JetBlue was and is. Could you include some background? David Neeleman was the founder and CEO of JetBlue from startup through 2007. He was synonymous with the airline for much of its life until the meltdown on Valentine’s Day saw him get booted out from the airline. Is he blaming Barger for the mistakes that got him pushed out? Anyway, I sort of agree with him. JetBlue isn’t as fun to fly as it used to be. Besides the hardware (the TVs and the legroom) it’s becoming more like everybody else. not entirely but i do think that’s part of it. i read it as he was assigning most of the blame to a hasty BOD decision. did barger help orchestrate that behind the scenes? who knows. it is pretty bizarre for a BOD to fire the president/CEO/founder over operational issues. think of the sins against airline humanity committed by the glenn tiltons of the world, who manage to keep their jobs anyway, or the doug steenlands and steve wolfs who manage to be so terrible they get fired, i mean bought out, and then still resurface elsewhere! and poor david was exiled to brazil!?!?!?!? It seems to be that way. He made it sound like the COO was supposed to handle the things that got him fired and the COO was Dave Barger. Brett – FYI – you’re missing the third “e” in David’s surname in sentence. ps i looked for some sort of “private message” thingie before posting this in comments but could not find. sorry! I always enjoy your interviews, Cranky. Keep ’em coming. There could be a lot of reasons he’s still a large shareholder. We have to assume much of his holdings are the result of compensation as CEO over the years, so some could be restricted in terms of how many he can sell and when. The other likely reason is taxation. You don’t just sell hundreds of millions of dollars of shares all at once; you would spread that out over several years or even decades. Just because he doesn’t “need” the money, doesn’t mean you just toss it all out the window. If he didn’t need the money when he started Jetblue, why is he still a large shareholder if he is not happy with them? As a large shareholder and founder, doesn’t he still have any clout to get things changed? Sounds like he needs to just put Jetblue out of his mind and spend all his efforts on Azul since the two don’t compete in the same market. He still wears Clueless well, on the other hand, JB having now hired a bunch of old hands, is now just like any old legacy airline. Nothing special in the air. In JetBlue’s defense, they still have a reasonable checked baggage policy, unlike every U.S. airline not named “Southwest.” JetBlue’s policy states that “Each customer may bring one bag free of charge.” They need to aggressively advertise that fact because it would attract customers away from everybody else, esp. Virgin America. Virgin started out with a different vibe but started with the nickel-and-diming like everyone else. It sounds like he is still bitter. I’ll bet anything Azul somehow links up with jetblue though. Hence the whole blue thing. Then he’ll change his tune. He keeps getting fired. Wasn’t he fired at Southwest when it was sold from Murray or Morris Airlines, then he got the can? I have flown jetblue before, I like them still do. VA, JB, and SWA are the way to go. Maybe he is bitter or maybe just sad that the airline he started has turned into something he never wanted. He strived to bring humanity back to air travel. That he learned in southwest which is still around. I guess seeing that the people he knew were sad and missed him struck a core within him. Changes for the better are always good but changes that turn negative are not taken so well. I guess that is how he feels in regards to Jetblue. Jetblue was his child and as any parent when you see you’re children hurting it hurts you to. Thanks nice article! I really enjoyed reading it. He basically called the JetBlue management week and it almost seems as though he feels Dave Barger was like the snake in the grass that plotted to get him ousted. He talks about the COO at the time which was Dave so that’s where I got that from. Hey do you work for jetblue? @ flyboy do you work for jetblue?